This is where the sun rises first in North America. Where Vikings landed over 1,000 years ago. This place is home to the oldest settlement and the oldest city in North America, but is the youngest province of Canada. A vast land, with a relatively small population, Newfoundland and Labrador has some of the friendliest people you'll ever meet. Here, you can immerse yourself in wilderness solitude one day and embrace a vibrant culture at the cutting edge of the contemporary western world the next. This is a land of rich history and natural wonders: stunning coastlines, breaching whales, icebergs, and some of the most incredible skyscapes you'll ever see. Newfoundland and Labrador is one of the best places to see and appreciate nature in all its glory. Dramatic coastlines, sweeping barrens, thick boreal forests, ancient rock formations, teeming seabird colonies, tiny alpine blossoms, and rich marine life are all part of our diverse natural heritage. From the island's rugged south coast and maritime barrens, through the islands of Witless Bay and Baccalieu and the Tablelands of Gros Morne National Park, to the Torngat Mountain ranges and the sub-Arctic tundra of northern Labrador, the natural, wild beauty of this place surrounds you at every turn - largely untouched and unspoiled. The province is also home to three National Parks, 18 Wilderness and Ecological Reserves, and breathtaking botanical gardens. Luckily, this place has no ragweed (allergy sufferers rejoice! ), no snakes, no skunks, no raccoons, and no poisonous insects or arachnids. With 29,000 kilometres of coastline, it's not hard to spot plenty of whales, seabirds, and icebergs. There are 22 species of whales alone, including the world's largest migrating population of humpbacks. Flying high above are, give or take, 35 million seabirds, which is why Newfoundland and Labrador is aptly named the seabird capital of North America. And if iceberg watching is something on your list, Iceberg Alley is the best on the continent to see these 10,000-year-old frosty giants meander down the coastline just waiting for you and your cameras. There's no shortage of wildlife in Newfoundland and Labrador (and you can enjoy it pretty much everywhere, without admission prices, feeding times, or fences to keep the nature in). The pristine landscape and abundance of large and small game make for incredible sightseeing, by car or hike. "I came home from both trips with award winning photos." "I have traveled with Kevin twice and both trips were great, (Newfoundland and the Yukon, ) He got us to the right spot at the right time, I came home from both trips with award winning photos, met some great people and had a lot of fun doing it, Kevin is on hand and willing to share his vast photography knowledge.!" "Kevin goes out of his way to make sure that the entire group is happy"
I took my very first photographic tour with Kevin in June 2017 to Newfoundland. I was nervous at first not knowing what to expect, but that quickly disappeared within a day. Kevin goes out of his way to make sure that the entire group is happy. He is in constant contact with his local connections to make sure that we will not miss any great locations or shots. He takes the time to get to know what your photo bucket list items are and does his best to make it happen. I ended up some fabulous photos and new friends. I had so much fun on this trip that I signed up for two more tours with him in 2018 and 2019. I highly recommend joining him on a tour. "He knows where to take us to get the most from the location." "I have travelled twice with Kevin now and have another trip lined up for next year. Kevin's depth of knowledge about the locations he travels to and his professional approach means that whatever the weather delivers, he knows where to take us to get the most from the location and ensure that everyone on the trip comes away with shots they are happy with. On top of that I consider Kevin to be a friend, and what is better than travelling to amazing locations with friends?" Why Come to Newfoundland With Me? I have been travelling to Newfoundland and Labrador for many years now. From Rose Blanche to Gros Morne, north to Quirpon and Labrador, and up and down the south east coast. I have led trips for landscapes, wildlife, icebergs and those wonderful, cute little birds we all love, the Puffins. In total I have lead seven photography trips to Newfoundland, and some personal scouting trips. Over the years I have refined my trips with the best partners in the province to make them perfect for the photographer. My partners for whale and iceberg tours are experienced guides and will get us where humpback whales are each and every trip. My tour partner that owns the lighthouses we stay in make my trips some of my most memorable ones because of the staff, the experience, the fun we have, and most importantly to you... the photography opportunities. I do my best to try to minimize your time in the vehicle. 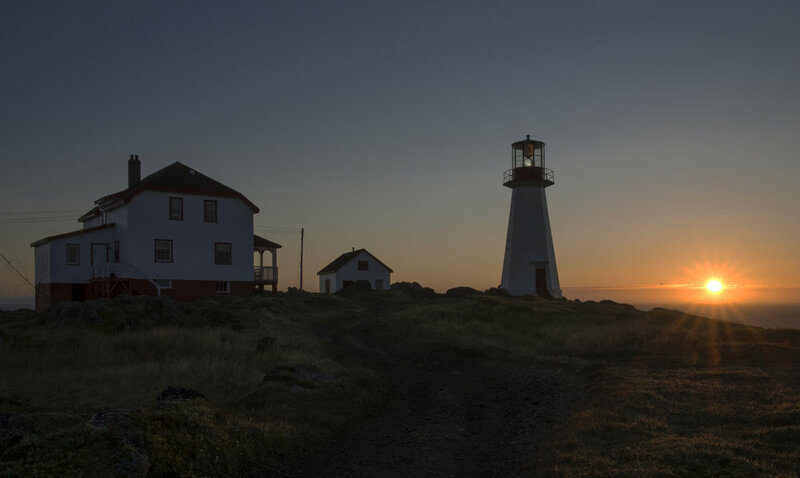 Newfoundland is a vast Province and other companies try to do all the highlights in one trip. Would you rather be out taking photos or sitting for 5 to 6 hours in a car to get to the next location? I think I know the answer to that one... lol... I minimize the drive times as much as possible because I know the hidden photo stops others that aren't as experienced as I am in Newfoundland, don't even know exist. I also will make sure you are prepared with the right equipment before you leave home. My pre workshop briefings will ensure that you have packed the right clothes, you've got the gear you need and you know where we are going to be photographing during each day of your photography vacation with me. All the logistics will be handled, all you have to do is show up, shoot and have fun on vacation. Please check out the photos and trips I am running below. I hope you find your next photography vacation here. Join Me on the east coast of Canada as we track down icebergs on their journey south, migratory whales that are on their journey north, and timeless lighthouses throughout the pristine landscapes along the northern and western coastlines of Newfoundland. This Muench Workshops trip is going to be ideal for the photographer that wants to take those photos of the quindescential east coast, colourful buildings along the coastal waterways. As an added bonus we will take you to North Americas largest colony of Puffins that you can photograph form land and put you up close and personal with humpback whales that will be swimming around the icebergs off the east coast of Newfoundland.